"C'mon man, you're stepping on my ankle for what?" 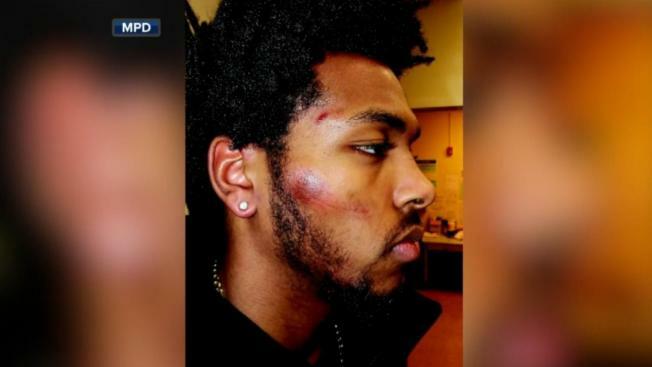 Newly released police videos of the stun gun arrest of Milwaukee Bucks guard Sterling Brown show one officer stepping on Brown's ankle while he was handcuffed on the ground and others discussing the potential backlash of taking down a black professional basketball player. The body camera and squad car videos, obtained by WISN-TV and posted online Sunday, show the moments after Milwaukee police officers swarmed Brown in January when he didn't immediately take his hands out of his pockets as ordered. Brown had been standing and talking with a group of officers as he waited for a citation for illegally parking on a disabled spot outside a Walgreens. Brown wasn't charged with anything and three officers involved in the arrest were disciplined, with suspensions ranging from two to 15 days. Eight others will undergo remedial training in professional communications. Brown has said he plans to sue the department. In one of the videos, Brown is on the ground and handcuffed when an officer puts one of his boots on Brown's ankle, holding it there and at one point pressing down. Brown doesn't mention being in any discomfort but he questions the officer about why he's stepping on him. Video released by Milwaukee Police shows officers tasing and detaining Milwaukee Bucks guard Sterling Brown. "C'mon man, you're stepping on my ankle for what?" Brown said. In response, the officer said he was trying to prevent Brown from kicking anyone. Other videos obtained by WISN-TV show an officer talking with two others who are seated in a squad car as they explained they were trying to protect themselves during the arrest. They also talk about how they could be perceived as racist for arresting a black Bucks player, with one saying if anything goes wrong, it "is going to be, 'Ooh, the Milwaukee Police Department is all racist, blah, blah, blah.'" Another video shows an officer in his squad car, calling to let a supervisor know he'll need to be on overtime before singing, "Money, money, money, money, money." In a statement Monday, Chris Ott, executive director of the American Civil Liberties Union of Wisconsin, said his organization was "outraged" that the officers "were focused on planning damage control for their excessive use of force, instead of treating Mr. Brown with the dignity and professionalism that everyone — whether a Bucks player or not — deserves from the police." Milwaukee police Chief Alfonso Morales has apologized to Brown and on May 23 released body camera footage of the officer who initially contacted the basketball player outside the store. The incident happened a month before Morales was appointed chief, following the retirement of Edward Flynn. Since becoming chief, Morales has pledged to improve the Police Department's relationship with minorities and to be more transparent with cases of officer misconduct. Morales said Monday that raw video footage from all body cameras was released solely to Brown's attorneys last week. Additional videos will be released to those filing public records requests once statutory requirements have been reached, Morales said in a statement.